Many natural cold and flu remedies exist that ease suffering and build health. These home remedies are easy to do and will keep 'less than the best' store bought medicines out of your body. Medicines bought at a store often contain sweeteners, dyes and several other synthetics compounds that add toxicity to your body and do not build health. Keep reading for some basic guidelines to follow when sick along with more specific remedies and some recipes to make your own medicines at home using real food and herbs. I have never had a flu shot and rarely get sick. When I do get sick, I use several of the cold and flu remedies listed on this page and I am never sick for long. If you start to feel sick... here are some things that you may find extremely helpful. Many things listed here are tried and true cold and flu remedies that have been used, in some form or another, for thousands of years across many cultures. The basics are the things that are helpful when sick and also great to do every day to prevent illness. If done at the first sign of a cold or flu, the following flu remedies may prevent you from getting sick altogether. Rest and good quality sleep: It is when your body is at rest and in deep sleep that the most healing takes place. Taking the time to rest at the first sign of sickness will prevent you from having to take much more time out later. Of all the cold and flu remedies discussed this is the most important one! Avoid non-foods: Keep junk foods, non-foods, processed and packaged foods, refined sugars, chemical additives, etc. out of your diet. Also avoid dairy, wheat, corn and soy - these foods are highly allergenic, mucous forming and acidic. Avoid drugs and stimulants: Stay away from nicotine, caffeine, alcohol, etc. These things tax your system making healing harder for your body. As much as you can, also avoid synthetic, over the counter medicines that contain chemical, toxic and unhealthy ingredients. Drink good quality water: Drink room temperature water on an empty stomach to help flush your system. Add some fresh squeezed lemon juice to your water. Do a fast or detox cleanse: All animals, when sick, will refrain from eating. Fasting increases your body's ability to heal quickly and efficiently. Do a juice feast (or juice fast): Another great way to cleanse and help your body to heal faster. Ingest only real food: If you are eating, eat plenty of fresh, organic fruits and vegetables along with fresh green juices and/or green smoothies. Get sun: Sun has many many health giving properties. Get adequate sun for your body type on your naked skin and eyes (no sunblock, lotions, creams, cosmetics, contact lenses, glasses or sunglasses). Breathe fresh air: Get outside and breathe fresh clean air, filling your lungs with health giving oxygen. The air indoors is often polluted with many chemicals. When inside, fill your home with plants, keep windows open and a ceiling fan running to help refresh that indoor air. Scrape your tongue: Your body is trying to push toxins out through your tongue. Scrape your tongue to avoid re-ingesting these or adding more burden to an already sore throat. Cleanse the colon: The colon is where much waste gets backed up causing us to feel ill. Cleansing the colon will relieve the toxic build up and help your body to regain its healthy balance. The colon is cleansed through enemas, colemas or colonics. Gentle massage and/or Dry skin brushing: This will stimulate your lymphatic system helping toxins to be whisked away and nutrients to get where they are needed. Meditate, visualize and set an intention for healing: The power of the mind and the subconscious is mighty. The above list sets the foundation for your body to heal and regain health. Fresh squeezed lemon juice: Use only organic fresh lemons. High in vitamin C and highly alkaline. Drink the juice of 1-2 lemons twice daily. Add a small amount of water to the lemon juice and drink through a straw to protect your teeth. Soothing hot drink: There are many variations of this drink - this particular one we made while travelling. All ingredients were very easy to find - honey, lemon, garlic, ginger and more.. click to see full recipe. Cough/sore throat drink: Another great and simple cough/sore throat remedy that you can make ahead of time so it is ready whenever you need it. Composition powder: This is a variation on an ancient recipe passed down through the times, and is the best and most effective remedy I know to relieve a dry hacking cough. Homemade cough syrups: Elderberry syrup and honey onion syrup. Easy to make and better for you than most store bought syrups. Master tonic: This is an easy recipe to make and I suggest making it ahead of time - we make a big batch of this every autumn. Take a shot daily for prevention and immune support. When sick, take a shot 3 times a day. Salt water gargle: 1 tsp of sea salt in 1/2 glass of warm water. Gargle in the morning and evening and throughout the day if needed. This is great for relieving a sore throat. Neti pot: Long used in history, this is a well known method for clearing and flushing the sinus cavities. Hot bath: Fill your tub with hot water and add epsom salts, eucalyptus oil and some rose petals. Soak and allow the oils and herbs to soothe and relieve your symptoms. Can also add 1/2 cup chopped ginger to bath. Click to read a recipe for a beautifully rejuvenating bliss bath. Foot soak: Add some chopped ginger, garlic and/or onions to the water. This will help to draw congestion down and out of your body. Will provide temporary relief, repeat as necessary. Herbal steam: Wonderful for relieving congestion and breaking up mucous. Pour hot water into a large glass bowl and add a drop or two of eucalyptus essential oil. Drape a towel over your head, over the bowl and breathe in deeply. If you don't have any essential oil on hand just use water, the steam alone will help. Hot water bottle: These are great to bring soothing comfort and warmth to any part of your body; head and neck for a sinus headache, lower back for that all over achy feeling or on your feet to help you fall asleep. During a recent visit to Japan we learned about an ancient Japanese product called 'yutampo' which is a type of hot water bottle but with a unique design that keeps it warm all night long. Japanese people put these at the foot of their bed, under the covers when it is cold. 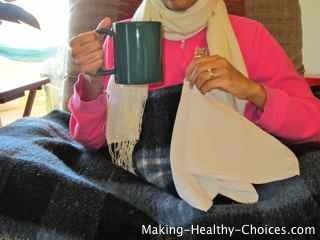 We found this invaluable to stay warm especially when sick. Throat wrap: Keep your throat wrapped in a natural fiber scarf (cotton, wool etc). Keeping your throat warm will ease a sore throat and a cough. Garlic oil: Chop fresh garlic, place in a small glass bottle and cover with olive oil. Let infuse for one hour or longer, if you need it quicker place the bottle in a bigger bowl full of hot water. Rub the garlic oil on your feet before bed, put socks on and go to sleep. This is great to help draw congestion down and out of your body and to relieve a cough. Chest rub: Rub olive oil on your chest, place chopped garlic and onions (wrapped in a cheesecloth) on chest, cover with a towel and then a hot water bottle. Great to relieve congestion. Alternatively rub the above garlic oil on your chest. Vapour rub: Eucalyptus, menthol and camphor are wonderful to help ease congestion. Rub on chest, upper back, neck and a tiny bit under nostrils and breathe deeply. Echinacea tincture: At the first sign of a cold, start taking echinacea. Take a dropper full every hour in room temperature water. Remember that the best cold and flu remedy of all is to give yourself some tender loving care when you aren't feeling well. The better you take care of yourself at the first signs of feeling sick the quicker you will back to feeling great. Do you have some natural cold and flu remedies that you use? Ask your parents what their parents did for them when they were ill. Let's bring back some of that ancient wisdom. Please share below. Share and help others to learn how to help themselves. Enter a title for your home remedy. Your remedy will appear on a Web page exactly the way you enter it here. You can wrap a word in square brackets to make it appear bold. For example [my story] would show as my story on the Web page containing your story.